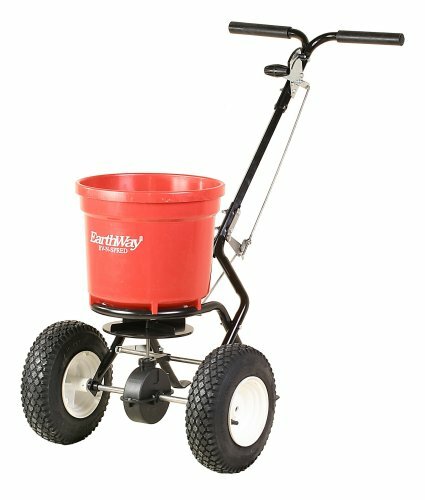 The Earthway commercial 50-pound walk-behind broadcast spreader features a high-volume, 1325-cubic-inch-capacity hopper with the ability to hold up to 50 pounds of fertilizer. 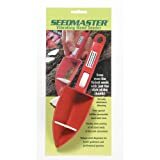 It includes the patented "Ev-N-Spred" 3-hole drop system to ensure even fertilization. 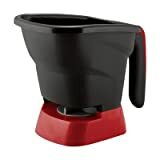 Its height-adjustable handle has 3 positions for greater comfort; the spreader's rate can be adjusted with a control set high on the handle. 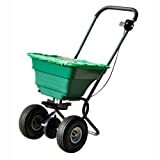 The spreader's heavy-duty frame has a 175-pound load-bearing capacity for greater durability; its large, 13-inch-diameter pneumatic tires have rustproof poly rims and are designed for long-lasting wear. It also features a super-duty gearbox, designed for durability and long-lasting wear. Assembly is required.